Study Geelong is committed to protecting user privacy. We understand that visitors and users of this website are concerned about their privacy, and the confidentiality and security of any information that is provided. 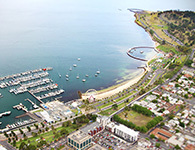 Information collected on the Study Geelong website. Unless you specifically tell us, the Study Geelong will never know who you are when you access the website. your traffic patterns through our site such as the date and time of your visit to the site, the pages you accessed and documents downloaded, the previous page you visited prior to accessing our site and the Internet address of the server accessing our site. Circumstances where Study Geelong will attempt to identify your personal details. In the event of an investigation when a law enforcement agency may exercise a warrant to inspect the Internet Service Provider's or Study Geelong's website logs. If you choose to fill out forms on our website which ask for your personal details. No attempt will be made to identify your personal details except in the circumstances outlined above. When would your email address be recorded? We will not add any details to a mailing list without your consent, and we will not disclose your details to third parties without your consent, unless required by law. We will disclose your email details to the relevant authorities if necessary to protect the safety of the public or to protect the rights and property of Study Geelong. Our Internet Service Provider may monitor e-mail traffic for system trouble-shooting and maintenance purposes only. When you access the internet through a public ISP, each request you make to a website cannot be linked to a previous request, as each request does not contain a permanent unique identifier. Cookies allow website operators to assign a unique permanent identifier to a computer which can be used to associate the requests made to the website from that computer. Cookies indicate to a website that you have been there before and can be used to record what parts of a website you visit. While cookies in themselves may not identify you, in the way a name or address does, a cookie could potentially be linked with other identifying information. For example, if you provide extra information about yourself to the website by buying something on-line or subscribing to a free service, then the cookies can be used to build up a profile of your buying habits and what you are interested in. They can then be used to tailor banner advertising to your interests. How do you avoid cookies? Setting the browser cookie file to be read only. Whether you can do this or not may depend on what sort of Operating System (OS) or browser you are using. But if you can do this then the cookies will only last for as long as your browser is running. Set up your computer to delete the cookies file whenever you start your browser. Install a software product which will reject or manage cookies for you. You can perform an internet search to find them. Many browsers allow you to set them up so that you are notified when a cookie is to be written to your computer. However there may be instances where there are so many cookies that it becomes annoying to reject them all.